It was a packed house for the Rotary Meeting with two visiting Rotarians from Ludlow and two guests joining us along with our Valentines. 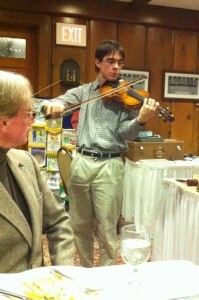 After dinner we all settled in to hear Hunter Foote from Wales entertain us with his violin. Hunter has a great talent and played several songs including a few Irish songs. He finished with a request for Greensleeves which he played beautifully. A was a great way to end our Valentine Celebration.